Kyle Glazier and Lynn Hume’s story in the Bond Buyer last week, “Brokers Violate Puerto Rico OS, MSRB Rules with Retail Trades”, about small denomination trades in the recent Puerto Rico bond offering in contravention of the offering document set off a firestorm. The Wall Street Journal’s “Finra Examining Trading in Puerto Rico Bonds” and Bloomberg’s “Finra Says It’s Examining Trading in New Puerto Rico Bonds” both reported on Friday that FINRA was looking into the suspect trades. What did the MSRB do? It destroyed the evidence and tried to re-write history. The Puerto Rico offering document (available here) says the bonds can only be traded in denominations greater than $100,000. The Bond Buyer story pointed out that 70 customer trades in the first few days of trading (by 4:57 pm on March 18, 2014) were below this minimum denomination intended to protect investors. 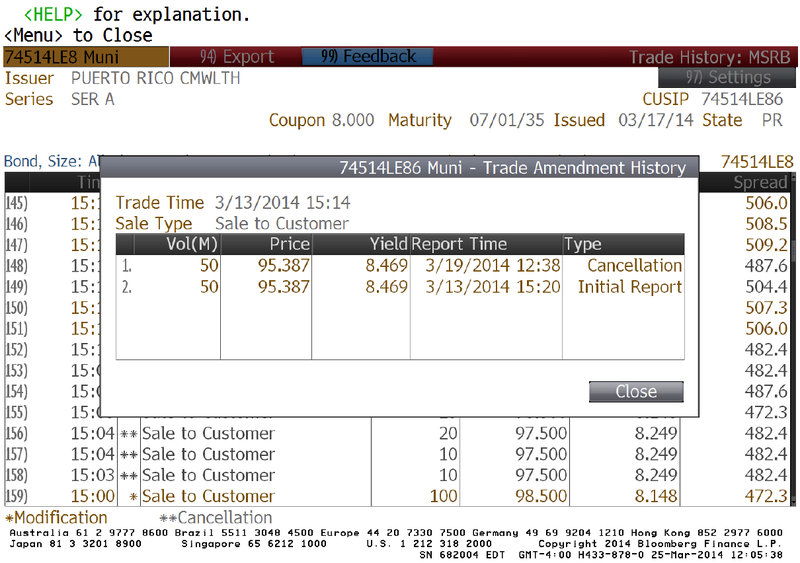 The trading in this Puerto Rican bond can be found here but you won’t find evidence of these trades any more in the trades reported on the MSRB website. What happened? Shockingly, the MSRB and the brokers who executed these violative and potentially fraudulent trades edited the tape to delete or modify these trades even though they had already settled. with this screenshot from EMMA for the same time period taken at 11:45 am on March 25, 2014. Notice the 5 “Customer Bought” for quantities less than $100,000 have disappeared. What happened? The MSRB and the brokerage firms that inappropriately executed trades got together and edited the tape. For instance, the $50,000 trade at $95.387 was deleted a day after the trade settled when Kyle Glazier and Lynn Hume’s story appeared. See the Bloomberg screenshot below. The $25,000 trade at $98.5 was re-written to be a $100,000 trade - two days after the trade settled. See the Bloomberg screenshot below. These Bloomberg screenshots allow us to find the MSRB’s missing 18 minutes of tape. Without Bloomberg capturing trades and modifications of trades we would never know what the MSRB and broker dealers have done to sanitize history. So how thorough was the MSRB’s scrubbing of history? Of the 70 sales to customers in violation of investor protection rules by the end of the March 18, 2014, only 8 remain. If you want to see them, look quickly because the MSRB and the industry continues to rewrite this history each day and the evidence of bad trades is shrinking each day. This bond isn’t the only bond that was traded in denominations which were not allowed by the offering documents and MSRB rules. We’ve identified a number of bond issues in which many small trades were executed in violation of offering circulars and MSRB rules. For instance, the 2012 Michigan Finance Authority (Concord Academy) bonds appear to have an unambiguous $100,000 minimum authorized denomination. The offering document is available here. The trading activity for this bond is available (at least until the MSRB changes it) here and includes trades less than $100,000. Also, the Harbor Point bonds underwritten by Stone & Youngberg (offering document here and trading here) appear to have had many trades well below the $100,000 minimum denomination. The MSRB is supposed to protect investors. The MSRB’s re-writing of inconvenient settled trade history highlights how the MSRB is more concerned about bond dealers than it is concerned about issuers and investors. MSRB continues to condone more subtle forms of investor abuse such as excessive markups (which we have written about in blog posts here and in our research paper here) and protect dealers from the sunshine. While FINRA investigates the trades the MSRB has tried to edit out of history, the Securities and Exchange Commission needs to force the MSRB to take its investor protection mandate seriously. 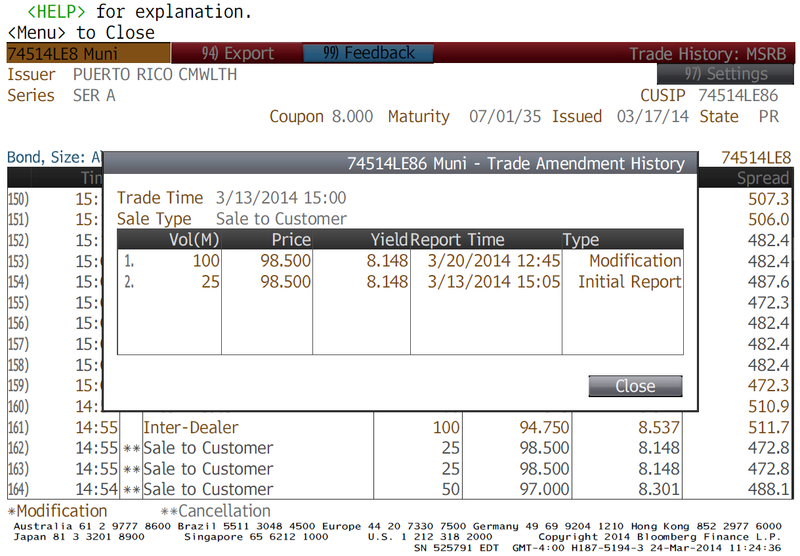 There’s more; we will discuss other problems with the trading in the Puerto Rico bond in future blog posts. UPDATE (4:40pm): Kyle Glazier and Lynn Hume have a followup story at The Bond Buyer discussing these cancellations.